The largest military force ever assembled—three million soldiers, 4,300 tanks, nearly 4,400 air­craft, and some 46,000 artil­lery pieces—assaulted the Soviet Union on this date in 1941. Since the 1920s Adolf Hitler had cham­pioned a cru­sade against “Jewish Bol­she­vism,” with its poli­ti­cal, ideo­logical, and econo­mic cen­ter in Moscow. Hitler believed that only when the Soviet Union was beaten down in a quick cam­paign would the British—whose island nation was cur­rently being blitzed by Her­mann Goering’s Luft­waffe—give up their soli­tary struggle against the Nazi juggernaut. 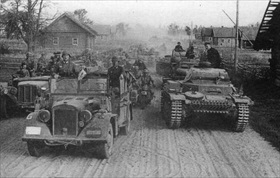 The blitz­krieg in the East, Hitler esti­mated, would take about three months to advance to the Ural Moun­tains-River Volga line, some 1,300 miles from the Third Reich’s eastern border. Once there, the Wehr­macht (German armed forces) could throw up a defen­sive line against Soviet Siberia and Cen­tral Asia and occupy Euro­pean Russia. Beyond those three months the Wehr­macht had no battle plans, no supplies, no rein­force­ments—no Plan B in other words. Opera­tion Barba­rossa, as the first strike against the Soviet Union was called, proved to be the start of Nazi Ger­many’s Unter­gang (downfall). Tacti­cally, the Wehr­macht won resounding vic­tories and seized some of the most impor­tant eco­no­mic assets of the Soviet Union, among them the heavily popu­lated and rich agri­cul­tural heart­land of the Ukraine. But the East­ern Front sucked Ger­many and its Axis allies in and refused to spit them out until they’d been mauled by Mother Nature or in battle. The Wehr­macht in 1941 was not equipped for winter war­fare. Frost­bite and disease caused more casual­ties than com­bat. There was no shelter from sub­zero tem­pera­tures (-40°F and lower). Equip­ment froze and air opera­tions were sus­pended. In one three-week period, Ger­man dead and wounded totaled 155,000. Some divi­sions were a frac­tion of their original strength. In the Soviet capi­tal Moscow, newly built-up, well-equipped units, some fresh from Siberia, approached over half a million men. On Decem­ber 5 they launched a mas­sive counter­attack that shifted the front line west­ward, over 200 miles in places. Opera­tion Barba­rossa, cut short by the on­set of an arctic winter the Ger­man High Com­mand had neither plans nor pro­visions for, cost the Ger­man Army over 210,000 killed and missing and 620,000 wounded in 1941, to say nothing about casual­ties incurred by other Axis armies. A cala­mitous, drawn-out death struggle in the East was now inevitable. 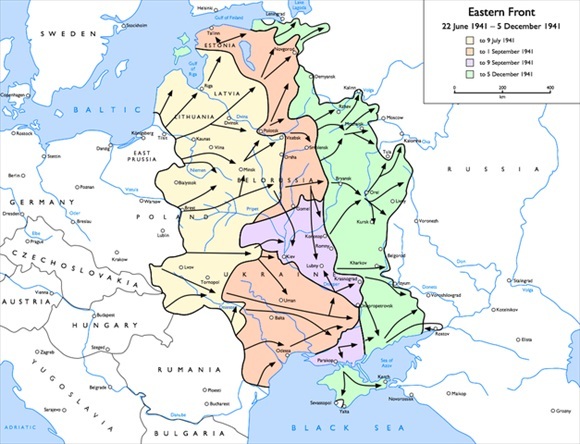 Above: Map of German operations against the Soviet Union, June 22 to Decem­ber 5, 1941. Opera­tion Bar­ba­rossa was the largest mili­tary opera­tion in his­tory in both man­power and casual­ties. It even­tually cost the Ger­man Army (Heer) over 210,000 killed and missing and 620,000 wounded in 1941, a third of whom became casual­ties after October 1. Unknown is the num­ber of Axis casual­ties among Roma­nian, Hun­garian, and Waffen-SS units, as well as co-belligerent Finns. 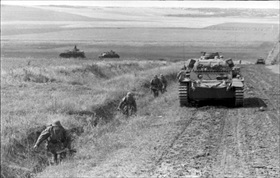 Right: A German tank and crouching infan­try make good time crossing the steppes in July 1941. But four months into the cam­paign, tempera­tures fell and there was con­tin­ual rain, which by mid-October would have turned this un­paved road into a muddy bog. The changed road condi­tions slowed the Ger­man advance on Moscow to as little as 2 miles a day. 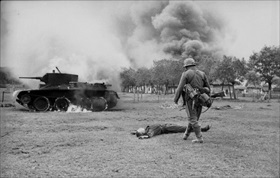 Left: An Army Group South infantryman encounters an enemy KIA (killed in action) and a burning BT‑7 light tank in the Ukraine during the early days of Opera­tion Bar­ba­rossa, June 1941. In the course of the five-month cam­paign, Soviet losses were over 465,000 killed, over 235,000 non­com­bat deaths, over 101,000 deaths from wounds after the vic­tims had been moved to eva­cu­a­tion zones, and 2.3 million MIAs (missing in action). 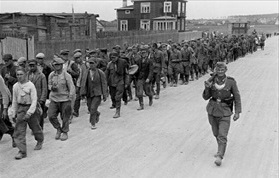 Right: A group of Soviet POWs in Bailystok, North­eastern Poland, July 1941, being marched to a pris­on camp. The Nazis’ con­tempt for the “sub­human” (Unter­mensch) Slav set the stage for atro­ci­ties rarely equaled before in Europe. In just eight months in 1941–1942, some 2.8 mil­lion cap­tured Soviet com­ba­tants were exe­cuted in the field or died under in­human con­di­tions (for example, star­va­tion, lack of medi­cal care, and ex­po­sure) in Ge­rman POW camps (Russen­lager). In line with their delib­er­ately geno­cidal poli­cies toward the 5.7 mil­lion cap­tured Soviets during the war, the Nazis are cre­dited with causing the deaths of 3.3–3.5 mil­lion Soviet pri­soners. By con­trast, between 374,000 and one million Ger­man POWs (out of an esti­mated 2.4 to 3.3 million) died in Soviet captivity. 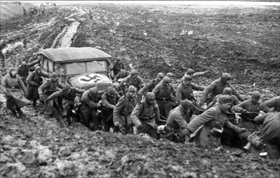 Left: German soldiers pull a staff car through heavy mud on a Rus­sian road, Novem­ber 1941. Hitler, arro­gant and ruinously over­con­fident owing to his blitz of suc­cesses in West­ern Europe, expected a victory in the East within a few months, and there­fore he did not pre­pare his Wehr­macht for a cam­paign that might last into a wet late fall, much less a bit­terly cold win­ter. The assump­tion that the Soviet Union would quickly capitu­late proved to be his, and Nazi Germany’s, tragic undoing. Right: On December 2, 1941, the first blizzards of the Rus­sian win­ter began just as one unit of the Wehr­macht caught a glimpse of the spires of Mos­cow’s Krem­lin 15 miles away. Some­time later a recon­nais­sance battalion crept to within 5 miles of Moscow, but that was as close to the mili­tary prize as any Wehr­macht unit man­aged. 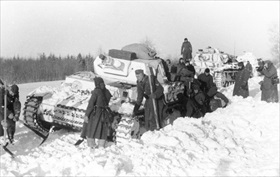 In this photo a Pan­zer IV tank in white cam­ou­flage is stranded in deep Rus­sian snow as its crew attempts to free it. At the right edge of the photo is a war corres­pondent who filmed the scene for audiences back in Germany.